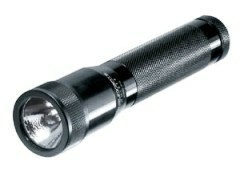 If you need a flashlight for your workplace, we carry a large assortment at Select Safety Sales. We have flashlights for you to use in your facility or for you to use out in the field. We carry industrial, LED and many more types to fit all of your needs. There are different ones to choose from depending upon where and how they will be used in your workplace. Browse our selection below and if you have a question or do not see the one that you are looking for, give us a call at 866-864-3495 or contact us through online chat. How bright does the light need to be? Incandescent Krypton, Halogen and Xenon lights are brighter than LED lights. Halogen has a longer life than Xenon. They both have an extremely bright light and are more efficient than regular bulbs but they produce heat so the bulb does not last as long with this type of light. How durable does the flashlight need to be? LED’s are extremely durable and long lasting and they do not require periodic replacement like a Halogen or Xenon light would. An LED could last up to 100,000 hours. A flashlight with incandescent light is not as durable as a flashlight with LED light. How wide does the beam need to be? Wide beams will give a lot of light in a small area but will not be as good for distance; smaller beams will give a better long reaching light. Some flashlights balance the two- giving ample light close and at a distance. This type would be your more traditional everyday flashlight. How Far does the beam need to reach? Do you want batteries that are disposable or rechargeable? Disposable batteries are alkaline or lithium and they are lower in initial cost than rechargeable batteries, they have longer run times and it’s easy to keep a spare battery on hand in case it is needed. Rechargeable batteries have a higher initial cost but are less expensive over the life of the flashlight. A rechargeable battery will usually be brighter than a disposable battery and are ideal for frequent use. If you choose disposable, do you want alkaline or lithium batteries? Both types have a long storage life- usually about seven years for alkaline and 10 years for lithium. Lithium batteries have a higher cost than alkaline batteries but they will last longer. Care must be taken with lithium batteries to reduce the risk of leakage. You should not mix brands with lithium batteries and you should not use a combination of old and new batteries.